Ernest Henry George (E.H G.) Dobby was one of three British lecturers that taught geography in Raffles College in Singapore (https://www.fas.nus.edu.sg/geog/about-us/department-history.html). Dobby joined the College’s Department of Geography in 1939 and in 1945 became the first lecturer in the College with a PhD when he was conferred the degree by the University of London. He became the Department’s Head in 1946 and first Professor of Geography in 1947, leading the Department when the authorities upgraded Raffles College into the University of Malaya in 1949. He published extensively and widely on Southeast Asia and Malaya and established the Department’s flagship journal, the Malayan Journal of Tropical Geography. Dobby did not only write for an adult academic audience – he also wrote textbooks for local schools. These were printed by the University of London Press and distributed mainly through the Press’s far eastern representative Donald Moore. 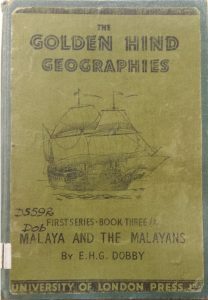 His first geography textbook Malaya and the Malayans was written in 1947, for children nine to eleven, ostensibly to replace the British textbooks previously used in Malayan schools, which were on the metropolis: “For Malayan children, Malaya is rightly the centre of their world, and that is why for Malayan children a book on their own country is substituted for one on Britain written for use in schools there.” (Dobby, Malaya and the Malayans, Preface). He also authored Malaya and Southeast Asia to introduce children and youth to the geography of the neighbouring region. 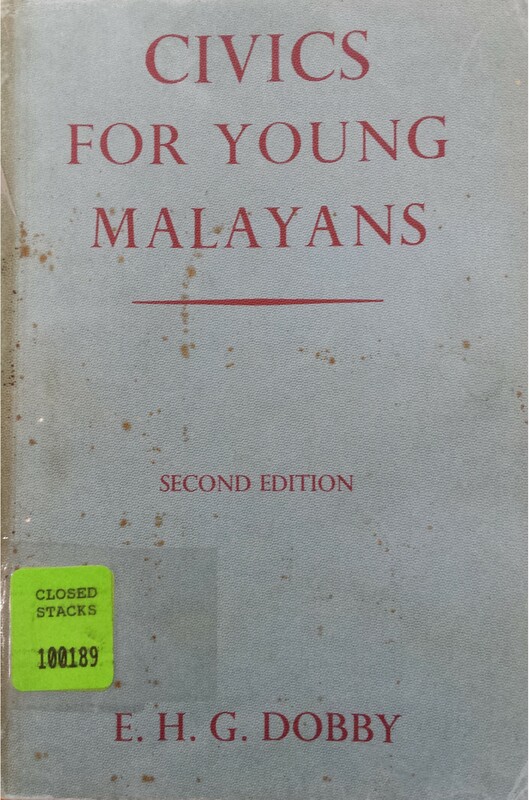 His third book for children and youth in Malaya was Civics for Young Malayans. The first edition was published in 1951, while a second edition appeared in 1956 to incorporate changes in the “public life of both Singapore and the Federation of Malaya” since 1951, namely the constitutional changes in the Federation and Singapore that allowed for the election of local representatives. The textbook was based on a series of lectures about “how people in Singapore and the Federation of Malaya arrange their life and work together” that Dobby made over Radio Malaya. 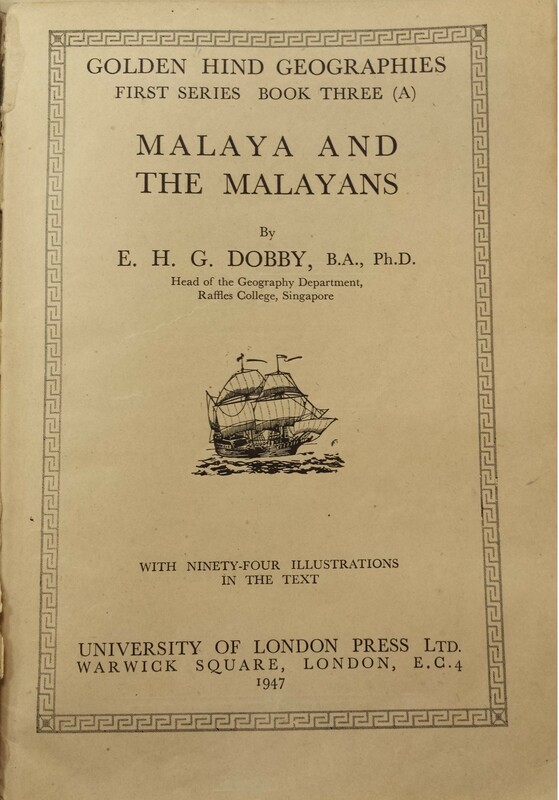 Dobby’s textbooks underline how as a colonial educator he participated in the efforts to create a Malayan curriculum which would “Malayanize” education. Benedict Anderson and Thongchai Winichakul’s seminal works highlight the nation as a “cultural construct” where media “technologies” such as newspapers, maps and other printed matter “create the knowledge of [a nation], create a fact of [a nation]”. Geography and Civics textbooks are such technologies bringing the “nation” that they discuss “into existence” in the minds of their young audience. 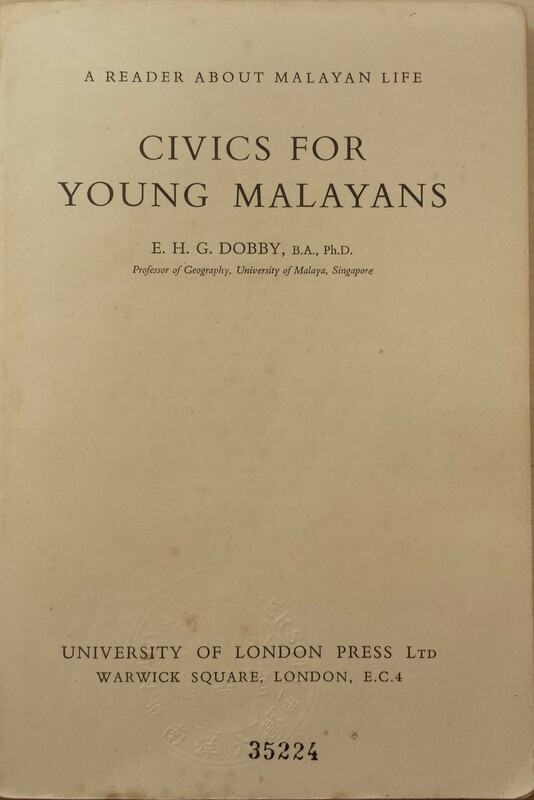 [i] Like the children’s publications for Chinese-educated youth in Singapore and Malaya in the 1950s, texts like Dobby’s Civics for Young Malayans and Malaya and the Malayans became a way for young local children and youth to encounter “Malaya’, know “Malaya”, and understand “Malaya”. Dobby’s Malaya included the states in the Malay Peninsula that formed the Federation of Malaya and Singapore, though he made it clear that the Federation and Singapore were two different political units with different political arrangements at that point in time. 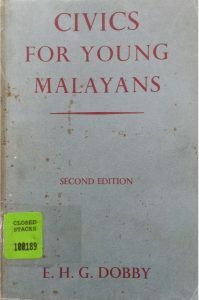 “the scope and variety of this reader about Malayan life…..are just what are needed at this stage of Malaya’s growth, when a new consciousness of a common destiny is making itself felt among all local-born people, transcending racial and cultural divisions, at any rate among the educated classes…Here at least is one attempt to make sure, through the English schools, that the boys and girls of today grow up to be active, intelligent, independent citizens” (Straits Times 29 October 1951). Subsequently, the Education Department of the Federation of Malaya Government, then still under the direction of colonial officials had the text translated into Malay. The Department bought 20,000 copies of this “first Malay Civics book”, entitled Ilmu Civics, for Malay schools in the Federation (Straits Times, 8 March 1955). Civics for Young Malayans was a product of the colonial power’s post-World War Two plans to transfer power into friendly local hands and preserve a socio-political and economic order that serve British agendas and interests. The Japanese Occupation of Singapore (1942-1945) had irrevocably disrupted colonial rule and the British returned to Singapore and Malaya to find themselves facing the rise of rural violence and rebellion, ethnic-based nationalist agitation and left-wing anti-colonial movements. They were also facing pressure from the British domestic public and their American allies to dismantle their empire. Dobby’s civics textbook was part of this massive pedagogical enterprise to create children and youths into a new “Malayan” citizenry. The colonial authorities and their allies and collaborators sought to preserve the existing political system and structure and to prevent the young from being radicalized. Civics was “the study of how people live and get along together” (9) and his aim was to help the “people of Malaya to get along with one another”. Dobby’s image of “Malaya” and of ideal Malayan children and youth promoted the Colonial Office’s vision of an independent Malayan nation that was pro-British, non-Communist, and socially cohesive. Thematically, the textbook outlined the growing harmony, mixing and interdependence between geographical, occupational, ethnic, special interests groups – that were becoming a “Malayan” community in spite of their differences. They were dependent on one another for their respective needs and interests. “Getting along” involved compromises and sacrifices of the various parties, to the benefit of the entire community. He used a seemingly innocuous analogy that would be familiar to his audience: “Classes are only made possible by each student arranging to behave so as to fit in with the others. Each gives up something he might like to do in order that the group may be able to work”. In order for the class to achieve the objective of being taught, the order and quiet of the classroom had to be preserved. Teachers might/should punish a trouble-maker who “do not fit in with the group”. Students could even “throw him out or sit on him” (11). He highlighted townspeople and agricultural producers in the rural areas as the two groups that it was most vital to help ‘get along’. These two communities “have ways of life which are more different from one another than they are from other ways of life in Malaya” (67). He argued that even though “these two communities of Malayans often do not understand one another’s difficulties or way of doing things”, they were tightly inter-dependent. Town workers were dependent on the agricultural producers for food while the latter depended on the townspeople for the “modern things and modern organisations [that] have been thought out and developed by townspeople” (68). This paramount concern with the urban-rural divide reflected colonial anxieties about rural violence and the socio-economic grievances of the agrarian communities that had become heightened after the Second World War. In addition Dobby divided Malaya into five major racial communities – Malays, Chinese, Indians, Eurasians, and Europeans. While he observed that a majority of the members of these groups could be found in specific occupations, he avoided a racial essentialization of occupation, pointing out that every community could be found in “every locality, in every type of work and in every profession” (71). 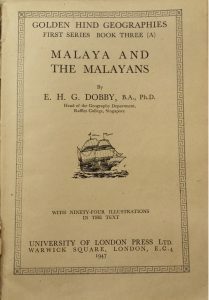 The image of Malaya Dobby sought to convey was a society where the disparate groups were “mixing together so much in work and play that the distinction [along racial lines] is becoming less” – there is little trace of Swettenham’s image of the lazy native, or Furnival’s plural society. Instead, education – specifically English education– “has been smoothing out the differences between people. Educated “young Malayans” of all races, in Dobby’s idealization, would understand and accept that “our common needs are becoming more important than our differences” and work together to meet these common needs and aspirations – “to bring up children and give them a good start in life…decent housing and clothes, to live healthily, to have amusements and friends, and to feel happy and contented” (71). This optimistic depiction of Malaya and matter-of-fact inclusion of Europeans as part of the social fabric of Malaya was clearly meant to insulate young Malayans from the intense anti-colonial sentiments and movements which were questioning and contesting the privileged political and socio-economic position of Europeans. His attempt to argue that there was “no boundary or barrier” between where Malayan communities worked and lived (71), on the basis that representatives from these communities could be found in all locations and in all occupations in Malaya, effaced a colonial history based on racial categories and practices, which had led to significant segregation and inequities between the different ethnic groups in Singapore. Young Malayans were also to learn how legitimate politics and government worked so that they would participate in them as responsible citizens. They ought to articulate their needs and interests through established political processes and institutional channels, including their elected representatives (provided for under the new constitutions). The different organs of the government would then address these articulated interests and needs in a fair, reasonable, and judicious way. 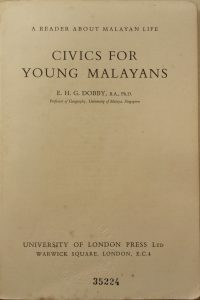 The civic role of young “Malayans”, “on whom the future of Malaya depends” (p. 160), was to articulate their needs through “the machine” and to ensure its smooth working – the meaning of being “civic-minded” (160). Young Malayans should help preserve rather than to overthrow the existing political structures. “They are the ones who will have to be more skilful. None of us can live better than our fathers did without being more skilful than our fathers were. We cannot improve standards of living for everyone while some Malayans continue to be unskilful and wasteful in their work” (107). If economic or social inequities ensued from this skills-based and productivity-based economy, the solution was the provision of social services. Dobby argued that “a nation is really only called modern if it has a generous set of public services” to support individuals who “suffer from conditions otherwise good for society as a whole” (40) – another indication of his interest in preserving the status quo. “It is to protect us that the government machine must attend to distressed people and get them back as useful wheels in our society, and prevent them damaging us, wasting our heritage and ruining the whole social machine in which we have our place. Religious persons may feel sorry for these poor people, but the nation deals with them so as to safeguard the welfare of those who are not in distress.” (130-131). He encouraged his young readers to spare one evening a week for voluntary work among distressed people. Volunteering and philanthropy was conceived of as a political activity (and not an expression of altruism or compassion and morality) to preserve social order and peace in the face of the deficiencies of the capitalist economy. Dobby also sought to explain and reify Malaya’s relationship with the rest of the world. These relations include economic, cultural, and ancestral ties. There was a notable emphasis on Malaya’s positive economic relations with Britain and the rest of the world, and of Malaya’s membership of the British Commonwealth. It was the British who made the Federation of Malaya into one country; previous to that, no one had ever ruled or governed the peninsula as one piece. He posited a cultural affinity between the different member countries of the Commonwealth based on their “common acceptance that government is by law… best made by the democratic method of representation by election” (p. 158), as well as by their identification with the symbols like the British Queen and her Crown (pp. 158-159). Malaya should avoid economic isolationism and protectionism or anti-colonial nationalism that new Communist regimes and some newly-independent nationalist governments of that period embraced. Civics for Young Malayans demonstrates how Malayan students in English-medium schools were inculcated with the requisite values and world view to explain inequality and differences in society and to maintain its equilibrium. It underlines the anxieties that colonial educationists and officials had about the project of building a new Malaya. They sought to educate local children and youth to imbibe a civic nationalism which reinforced the structures, hierarchies, and systems of the colonial state. Dobby adopted a didactic tone in his civics textbook. His prose was tedious, hardly mitigated by the few mundane illustrations. Certainly, by today’s standards it does not seem likely that Civics for Young Malayans would have attracted or excited the students about their new nation-to-be. Nevertheless, Dobby was a privileged producer and disseminator of knowledge, supported by the colonial broadcasting agencies and the colonial Education Department. As a lecturer in Geography, he commanded both academic authority and institutional access to the minds of the English-stream school children and youth who became Singapore’s citizens when the island-colony gained self-government in 1959 and independence in 1965. Some of those who imbibed the conservative orthodoxy that Dobby propagated would have become Singapore’s political leaders, policy-makers, civil servants. And through them we may be able to track Singapore’s colonial legacies which continue to shape our lives. Edgar Liao is a PhD. candidate with the Department of History, University of British Columbia. [i] Benedict Anderson, Imagined Communities: Reflections on the Origin and Spread of Nationalism (London: Verso 1991); Thongchai Winichakul, Siam Mapped: A History of the Geo-body of a Nation (Honolulu: University of Hawaii Press 1994), 15. [ii] T.N. Harper, The End of Empire and the Making of Malaya (New York: Cambridge University Press 1998), 274-275. See in particular Chapters 7 and 8 of this book. [iii] Harper, The end of empire and the making of Malaya, 292, 312-313. [iv] Sai Siew Min, “Educating multicultural citizens: Colonial nationalism, imperial citizenship and education in late colonial Singapore”, Journal of Southeast Asian Studies, 44(1), (February 2013): 49-73. See this article for a detailed discussion of the politics of British post-war educational policies. [v] Sai, “Educating multicultural citizens”, 49-50.